I love watching my sweet baby boy sleep. He looks so peaceful and adorable sleeping. Although sleeping is a time I often worry about him. It is very common for parents to have fears and concerns about baby's sleep. HALO is working to put parents fears to rest with the HALO safer way to sleep initiative. HALO Innovation’s SleepSack® wearable blankets have become the standard for hospital nurseries and parents alike. In fact, almost 1,000 hospital nurseries use the HALO SleepSack Swaddle instead of blankets through the HALO Safer Way to Sleep Initiative. That is 1.5 million births getting first-hand, in-hospital experience with the HALO SleepSack Swaddle and safe sleep practices! Leading health organizations agree that modeling proper baby care in the hospital is the single biggest influencer on how parents care for their baby at home. HALO recently added the cotton cable sweater sleepsack wearable blanket. It came at a perfect time. We have been having some really cold nights here. Just last weekend was really cold and to make it worse our heater broke. So it was really cold in the house. Evan is still to little to use a regular blanket so the SleepSack was perfect to keep him nice and warm. When he is comfortable and warm he sleeps longer, which is much better for me. The cotton cable sweater sleepsack was just what we needed for cold nights. The sleepsack is made from 100% cotton knit. It comes in 2 sizes, small (10-18lbs) and medium (16-24lbs). It can be worn over regular sleepwear and take the place of a loose blanket. It has a zipper that works from the bottom to make diaper changes easier. The sleeveless design helps to reduce the risk of overheating. The sack is large and allows plenty of room for kicking, but can not be kicked off so baby is warm all night. I received the blue Cotton Cable Sweater Knit SleepSack for Evan. It has a cute plane embroidered over the left chest. The SleepSack is so soft and cozy. I really wish they made these big enough for me. Evan looks so cozy and warm when he is wearing it. 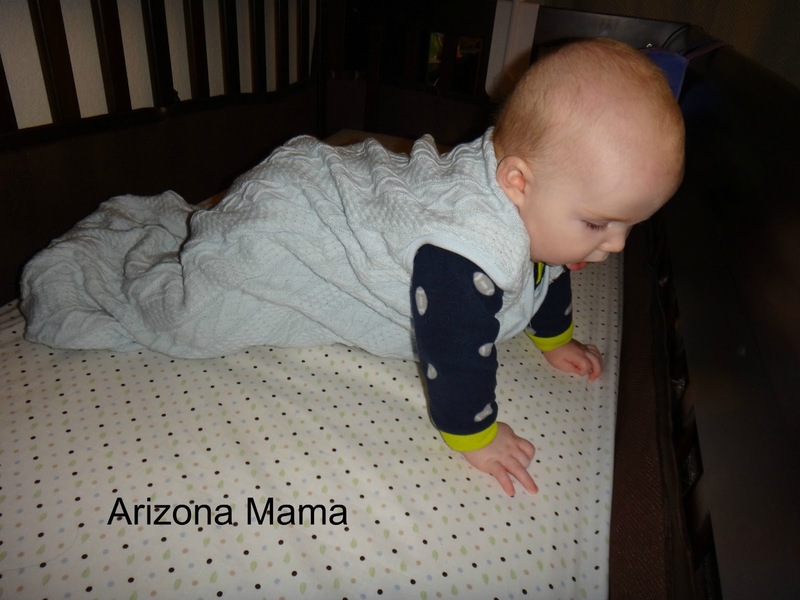 And since Evan is 6 months old he is moving and rolling around lots. He can easily move with the sleepsack on including rolling over. I can sleep better at night knowing he is comfortable, warm, and safe. 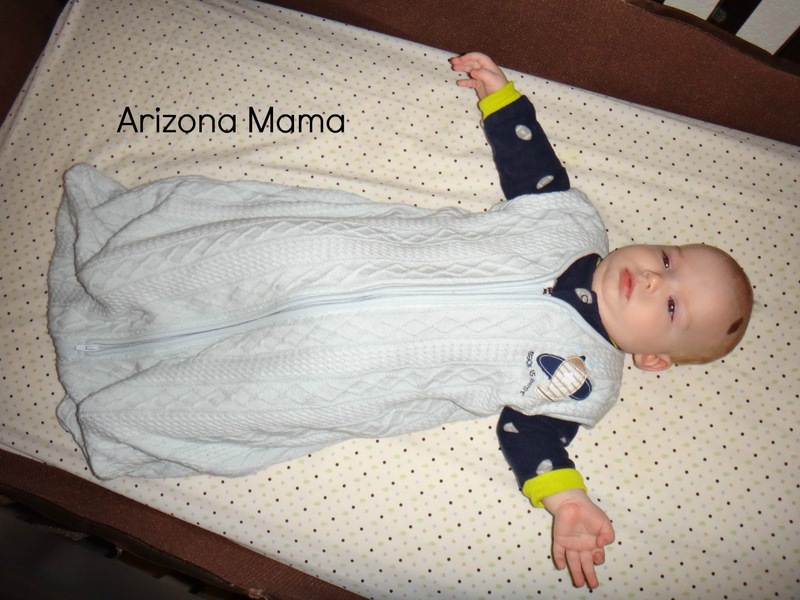 Win it: One (1) Arizona Mama reader will win a HALO Cotton Cable Sweater SleepSack Wearable Blanket in their choice of Gender and Size. I love their Sleepsack Swaddle! My babies always loved to be swaddled when they were newborns, but they used to scoot out of them and then get upset. Having something that keeps them swaddled is key! I'm expecting Baby #4 in early Sept, so this would be fantastic to use for that baby as he/she grows! I keep seeing posts about HALO's sleepsack swaddle and would love to try one! Thanks for hosting this great giveaway! I honestly don't know who it would be for... probably would save it for a baby shower gift. 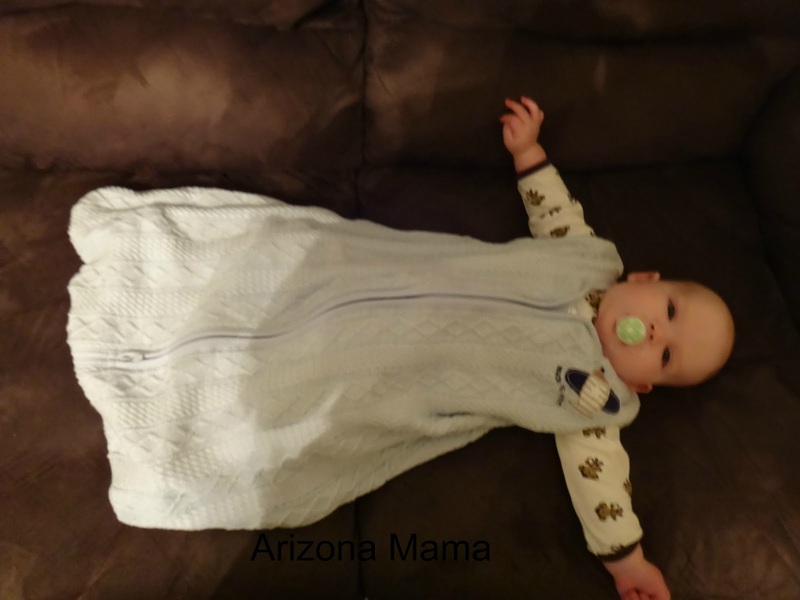 The HALO® SleepSack® wearable blanket ensure blankets will not end up near your babies face! I would love to win this for my son and his first child, my FOURTH grandchild! I love Halos sleep sack swaddles. They are making more in the smells rather than just newborn, but it be nice if they offered them in the next size up, too. I like the Halo® Two Piece Cotton Gift Set. I want to win this because we are TTC and I just love it! I love the organic swaddle sleep sacks. I would keep this for myself since I am due in April. I love the Velboa SleepSack® wearable blankets. I like the cotton sleepsacks. I like the SleepSack Crib Set in the Serengeti Green! I would probably give this to my sister who is due in June! Love Halo! My first daughter used a sleep sack, but my new baby is still in swaddles. Would love to try the knit sack! I like the early walker bags, perfect for my girl! I really like the Halo SwaddleChange changing pad cover. love the new lightweight knit. Just found out someone is expecting so as usual I always need wonderful baby gifts! I want to win this for my baby boy! I learned that HALO makes safe sleepwear for older kids, too! Not just tiny babies. I'd like to win this for my new baby girl. She's almost 6 weeks old! I am completely in awe at the whole aspect of Halo sleep sacks and how they are "safer" for sleeping because there are no loose blankets. Not to mention, my 3 week kicks herself out of her swaddle already so this would be perfect for her!